General Discussion / DO YOU KNOW OF A SUPPLIER FOR SOFA BED HINGES? 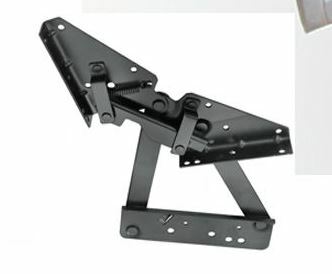 Do any of you know of a supplier for sofa bed hinges, such as in the picture below. The type we need allows the seat to pull forward and raise up (to expose a storage area beneath) and to click and lay then seat/back section into a bed. So far, the only suppliers I've been able to find are in China. The Business Of Upholstery / Do you keep a business journal? As an upholstery business owner, have you ever forgotten what you had told someone about a job, what you need for a job, to order, etc.. Over the years I have forgotten many things that would have been very helpful to remember. In recent years I have learned to take many more notes about jobs, payments, and the like. However, even so, sometimes my notes are scattered all over the place. I haven't had one central place to keep track of all the notes that are useful in running a business. The Business Of Upholstery / Where to get Logos printed on upholstery vinyl?? I have to give a price on a job of recovering 40 folding chairs, like this one in upholstery vinyl. They want their logo printed on the vinyl, similar to how it is in the picture. Does anyone know of any place that will print logos on upholstery vinyl? General Discussion / How much to Reupholster Turkish Chair? What price would you quote for a Turkish chair? It has been at least 30 years since I've reupholstered one. I have two basic questions: Roughly guessed for my client's chair (top picture) How many hours would you estimate, and how much for your total labor? The client said that he would supply the fabric, or leather, as the case might be. He was wondering about what the cost might be. Without yet seeing this pictures I gave him a rough off-the-top-of-my-head quote at least several thousand dollars. He was surprised that it would cost so much. After I gave his the estimate he said that in the past He had another upholsterer (who has recently died) reupholster 3 Turkish chairs for him. This former upholsterer specialized in antiques. The client said the this former upholsterer charged about $900 labor to reupholster the last Turkish chair. At the bottom this picture is says that this chair took 200 hours to finish. If you figured $900 (as according to this client's first upholsterer) that would work out to about $4.50 per hour. If you figured $30 per hour, that would make the labor on Buck's chair about $6000. If you figured $40 per hour, the labor would be about $8000. Then, then he asked about reupholstering it in leather. Having hand sewn some leather in the past, I don't think that I would want to cover it in leather. When he sent the pictures he said that if I couldn't or wouldn't do it in leather, he has some fabric to use. I'm still think that my first thought wasn't far off. What do you think? Do any of you recognized this style of sofa or the chairs and do you know anything about this type of sofa or the chairs or when they were made? The owner of the sofa thinks that it was made in the 50's. What do you think? What can you tell us about this sofa? When I first started ordering upholstery coil springs for retying I had a hard time figuring out what size to order. I wonder if other people might have that same problem. Well, today I've had time to do some cleaning on my shop, so I was sorting and organizing my box of a mess of upholstery springs. After I got them all sorted out I decided to make up a Upholstery Spring Compression Chart to help with figuring what sizes to order. I only have 6 sizes of upholstery springs on hand, which which are shown in the picture on that other page. So, after doing the compression tests on those that I have, I figured out the approximate compression of the others mathematically. I'd be happy for any feedback of any of you who do your own compression comparisons. My objective with the chart is to make it a little easier to order the approximate right size of spring for any job. Over the past years I've taken many thousands of pictures. My old Canon 520 digital camera was getting about to the end of it's life. So a week or two ago I replaced it with a new Canon SX40 digital camera. One of the nice features of this camera is that does an outstanding quality of HD video. The video quality is much much better than that of the "video" recorder I got a couple years ago. The ability to shoot good quality video in low light is great. So, I created a kind of a sample video last night, about stuffing a cushion. To make the video I only used the shop's regular lights. Here is the link to the page "How to Stuff a Chair Seat Cushion" page. I wrote an article to go along with the video. This shows and tells how I stuff cushions nowadays. Have any of you switched the handle on a LaZBoy recliner from one side to the other side? I had a visitor to Upholstery Resource website ask if that was possible. Apparently he is going to have an operation in the near future and it would be very helpful for him to have the handle switched to the other side. I have an old LazyBoy recliner at home. I closely inspected the mechanisms and the handle. It looks like it might be possible. I'm just wondering if anyone has actually done if. I have written out a set of instructions that I think would work. LazyBoy Recliner: Changing the Handle to the Other Side. Could you look the article over and see if it seems workable? In the past I've mentioned that I do most of my layouts on the computer. Before going on, please read my thoughts on Cutting Layouts and Computerized Layouts. I do what I'd call manual layouts on the computer. I should say here that if the software is configured properly, and if a template (which has many things prepared for each layout) is created, and with some training and practice, creating a layout is fairly quick straightforward. (On simple jobs I might not make a layout and may just make a simple pen and paper layout.) Over a number of years I've tried out various software (Open Office, Microsoft Publisher, TurboCAD, etc.). Near the beginning of my trying to do layouts on the computer I use Microsoft Publisher for a little while, but just doesn't have enough fine measurements or specific drawing tools. I used Star Office, which turned into Open Office for perhaps a couple years or so, on and off. All the time I kept looking for some software that would have the right features to make manual layouts easier. Eventually I found out about TurboCAD and bought it when it was on sale. It seems like a great software, it has a lot of features that were missing in Publisher and in Open Office. However it uses a whole different terminology than what I'm use do and it is a lot to wrap one's mind around. It also takes a lot to set up. It took me a couple years (on and off) to finally begin to understand it enough to use it pretty frequently. After some time I left Open Office a few years ago because it was a little clunky to use and it just wasn't printing out larger documents very well. For perhaps a couple years I used TurboCAD almost exclusively. Using TurboCAD helped me to learn some better ways to do layouts. However, since I had to buy it, I couldn't use it on both my laptop and my desktop. And it was complicated. I still wanted something simpler. I wanted to find something that other upholsterers could also use. TurboCAD was just too complicated to fill answer that desire. I finally decided to go back and give another try to OpenOffice/LibreOffice. Because of LibreOffice has some improved features that Open Office didn't have, I decided to go with it instead. After having used LibreOffice for the last year or two I have mostly, kind of, settled on using LibreOffice Draw for now. LibreOffice is a fork of Open Office, so those two would be very similar in how they work. In LibreOffice (and maybe also in OpenOffice) the print out problem with large sheets has been fixed, and it does a fairly good job at print out cutting layouts. They have improved LibreOffice enough, and now I understand it better, that using it for making cutting layouts is going pretty well. In some ways you might say that I'm kind of a software junkie. One thing I do a lot of is testing and experimenting with software. Over the years I've done a lot of changing settings, looking through the help systems, trying to see if there is anything that I can change, or learn to do differently, to make the software better meet my needs. Sometimes I find settings that make things go better, sometimes I just learn to do things differently, and if neither of those two works, sometimes I just learn to make do with what the software will do, at the time. But I never quit trying to find a better solution, all the while I am using the software. I say all this say that I think I've learned how to do cutting layouts on LibreOffice well enough to try to also teach others how to do it. While the methods I've learned may not be idea for all people in all circumstances, I think that it will work fairly well in most circumstances. So I just want to let you know that I've been writing a tutorial about using the Draw module of Libre Office for making Cutting Layouts for upholstery, which probably also may apply to Open Office Draw. Eventually I want to make Part 2 of the tutorial, which will go step by step in making a cutting layout. I don't have time to work on Part 2 right now, but Part 1 is at least a beginning. I have a very unusual request from a potential client. He is involved with a large food processing plant in Portland that has large conveyor belts. These conveyor belts need to have tarps hanging below them to catch anything that drips off the conveyors. He has previously purchased some catch tarps from a company that is a large distance from here. Those tarps don't fit very well. He is looking for someone in the area to make some tarps that would tarps to fit the conveyors. He said that the tarps would have to be fit around some obstacles, etc. Here is a drawing of the conveyors that need the catch tarps. He said that he can't find anyone in Portland that does this type of work. I'm located about 1 1/2 to 2 hours away from the plant. He found us on the Internet and wondered if we could do the job. Realistically, it seems I should have said NO right away. But I seem to be a glutton for punishment and something about the job intrigued me. (Maybe I was flattered that someone "wanted" me to do a special job for him) Anyway, for whatever reason, I told him that I would give it some thought. In addition, I like to plan out unusual stuff (part of my thought processes). Here are my thoughts about the job that I have been writing out. Also, what type of vinyl would you suggest for doing this job? Thanks for putting up with my nonsense. I'm putting together a list of basic hand tools, additional tools, and machinery used to upholster furniture. I've started the list here: Basic Upholstery Hand Tools. Could you look it over and give me feedback and suggestions about what you would suggest for tools? I'd trying to have several lists: 1.) a very minimum set of tools, the bare bones of what someone would need to recover a sofa or chair. 2. A More advanced list of what is need to do upholstery professionally. 3. List of machinery and their uses. 4.) Perhaps a list of any specialized tools (and what they are used for.) Any other suggestions would also be appreciated. Hammer: 16 oz, straight claw, which can be used to strip the old cover off. Webbing Stretcher: You can substitute a 1 x 4 board that is about 8 inches long to use as a webbing stretcher..
General Discussion / Does anyone know where we can get this vinyl? We have a client who would like a heavy duty silver or grey colored vinyl (for use on boat seats) that has special design on it, like this. Does anyone know if someone makes this type of vinyl, and where we might get it? In case anyone is interested, I found a sale on Bosch Foam Cutters. I just purchase one and received it today. I had ordered it (all the pieces separately) from The Tool Barn Saturday and just received it today. They were, and are still, having a sale. The Bosch foam cutter cost me $420 complete (with body, 8" blades and blade guide, and a footplate.) The shipping was free. I'm so excited that I finally have a real foam saw! I've waited a long time for this. When I worked with my dad many many years ago he had a Bosch, and it got a lot of use. It eventually quit working, and like idiots, we threw it away. I have not had a real foam cutter for many years. I've always used a combination of 1.) ordering foam cut to size 2.) electric carving knife 3.) band saw 4.) jig saw 5.) my 12" Scissors. IN my search to find 13 gauge upholstery back springs, I came across the Ansaldi & Sons website. Some of the items they have listed are similar to Van Dykes. They also have listed, on this web page, the type of springs I'm looking for, 13 gauge 6" and 8" upholstery springs for backs or pillows. Their website looks good, with lots of stuff listed. My hesitation is that when I did a google maps search of their street address, it shows just houses in a wooded suburban area. I called them and was told that they are an Internet only business. They don't have a store. But they said that they do have a warehouse. I don't know if that means that their garage is their warehouse, or if they have a physical warehouse someplace. The lady said that the address is the one on the website. When I did a reverse search of their street address, It shows that there are some people named Ansaldi living at that location, so that is at least a plus that they are using their names. So, has anyone ordered anything from them? Do you know anything about them? Also, do you know of any other place where I can get 13 gauge upholstery back springs? General Discussion / Where can I get Elastic Canvas? I'm giving an estimate for some chairs and a loveseat in a college cafeteria back room. They furniture has a kind of (for lack of knowing what else to call it) an elastic canvas that is used to support the loose cushions. I realize that I could use elastic webbing in place of it (which I may have to), but am looking first to see if anyone knows where I can get this product. Anyone know where to get this elastic canvas and what it's real name is? Here is a picture of it in use.